I mean don’t you want an easier way to carry these around? I’ll never forget the excitement and adrenaline rush that came from the first times my brother and I ever got to ski. I was only 10, but we were visiting Grandpa in Colorado, and one of the gifts over Christmas were ski lessons over 4 days. So some of my early childhood memories are learning to ski on the Rocky Mountains, rushing down the slopes, learning to slow and stop, and seeing some truly stunning mountain scenery. At my particular school there were junior high ski trips (no one growing up in mountains might consider a large hill ski-worthy, but in Iowa the Montezuma ski slopes were as close as we were getting) which meant more fun in 7th and 8th grades, and then was just as fun racing down the slopes or the trail that maybe wasn’t supposed to be open, weaving around others, and finishing perfectly right in line for the next run. Admittedly, I was showing off a bit on those as the memories of skiing on the Rockies, and a complete lack of fear when I was young, did me good in that case. One thing worth noting: many of the brands that appear on here may have several different styles that could easily make a top ten list. We’ve done our best to distill them to the best of the best and to give you a wide variety of options and choices but don’t be afraid to really dig in if you are already in love with one of these companies or brands. There are many great options out there for sure! So for those of you lucky folks who have consistent access to some mountain slopes – here are some of the consistently highest rated ski boots renowned not only for their style but for excellent fit and reliability. Outstanding option for a comfortable and sturdy high premium quality ski boot. Rossignol is a name that avid skiers are very familiar with, and for good reason. The Evo 70 design of the Rossignol brand is one of our favorites, and that is an attitude that has been shared with many avid skiers and snowboarders, as well. Featuring 9 sizes running from 245 to 325, these ski boots have sensor technology and feature a polyurethane cuff and shell for solid durability and control while the liner is designed specifically with extra padding for a truly comfortable fit. From the true beginner to the solid intermediate skier, this is a reliable and comfortable ski boot with a design that is set to properly and comfortably accommodate a medium to wide forefoot and leg. For those of us with large feet and large calf muscles – this is a definite plus. Your feet in an Evo 70 ski boot stays insulated, padded, and comfortable in these ski boots and a soft flex means you don’t have to worry about sore feet after two or three hours: the bane of those of us who love to ski but have a hard time finding a good fit and the right comfort. The diagonal positioning of the sensor grid helps improve the shell wrapping while also allowing other design bonuses such as reducing weight and increasing the rigid torsion ratings. Add in the enhanced precision, power, and control and it is hard to argue with what this premium high quality ski boot brings to the table. A truly 5-star elite pair of ski boots. 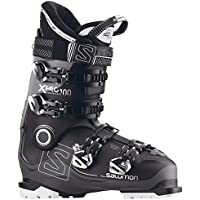 The Salomon X Pro 100 ski boots are a premium level mens’ ski boots that are incredibly popular among outdoor enthusiasts hitting the slopes, and in fact they often are marketed as the best selling ski boot in all of North America, which definitely adds to the strong presence they enjoy in the market. The Salomon X Pro 100 gains especially high marks for its extreme adjustability, which for many skiers means whether your feet are normal size, wide, large, or both wide & large, you can move the buckles and micro buckles in order to get a fit that is perfect to you and customized to your specific needs. The liner inside the boot is oriented to comfort, which is an additional bonus for skiers at the beginner and intermediate levels for sure. This is also a boot that is a good fit for the majority of ski types on any given ski wall, making it an outstanding choice even for skiers who are transitioning from beginner to various levels of intermediate. While certain advanced level skiers might look for something different, we’re talking about skiers there who are at the point they don’t search for information anymore – they know the ski equipment inside and out to move from professional ski boot at that point. The X Pro 100 edges out the X Pro 120 in our estimation because there is a major difference in stiffness. While the 120 can be a slightly more precise fit that gives more control for skiers with regular sized fit, the 100 gives much more comfort in fit. This is also one of the best options for wide feet – which is essential for individuals like me who have extremely wide feet. Every millimeter counts. The custom shell and excellent liner means this ski boot can be durable, functional, and comfortable all at the same time. Over 80% of the foam in the liner is thermomoldable, meaning the fit can be customized even more to fit your feet. This is a truly outstanding premium ski boot. Outstanding high quality ski boot. 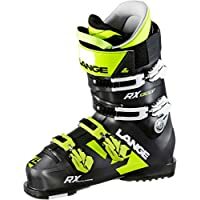 Building off of the successes of past models, and improving by doing away with less popular or successful features, the RX 130 RV from Lange is an excellent ski boot that offers a mixture of all-mountain features with a dash of racing pedigree that combine to make an outstanding total ski boot. The trademarked Dual Core shell and 3D Dual Liner work together to create a better and more inclusive fit that not only gives comfort and protection but also optimizes the transmission of power from your legs to the skis on the slope, letting you slice down the side of a mountain. The new fit with the RX has gained a large number of fans because it keeps the strong heel lock and foot hold skiers loved about earlier models while still providing better interior padding and comfort right out of the box. The special process (this is referred to as dual core) that is used in mixing materials during construction means a better shell wrapping and better rebound and control. There’s a lot to really like about these ski boots from Lange. Issues from past designs of having a roomier toe box, a more comfortable lining, and finding a way to do that without sacrificing the exceptional power and control that Lange ski boots were known for. 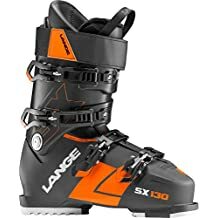 For many heavy skiers, the Lange RX 130 LV ski boots really are as good as it gets, offering comfort, high level control, and more, and open to more skiers and winter athletes than ever now that there are wider sizes available. These are really exceptional ski boots, high level premium options that will give plenty of power and precision when skiing down the slopes while providing a high level of comfort for the individuals they are designed for. There’s no question: this is all about perfect fitting for the narrow foot, so for those of your with thin feet this is an awesome option though if you tend to have wide ones like me, then you might have to keep on looking. The custom adaptive shape shell is a major part of what makes these ski boots an outstanding option. 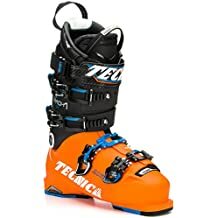 Made from polyether shell and able to be adjusted firmly to your lower leg, this is one of the most anatomically accurate inner shells of any ski boot out there – and that means an incredible amount of power, feel, and control as long as you have the right shaped legs for these bright orange ski boots. This design includes a 130 rating for flex, yet provides a fully snug fit. The exterior of the line can be heat stretched, and this liner has a very unique ability to conform to the foot and lower leg of the individual. These boots tend to ski extremely well – some skiers consider these among the best options out there. Exceptional pair of ski boots by Atomic. 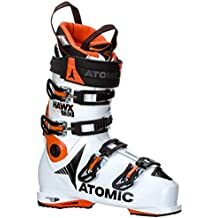 The Atomic Hawx Ultra are a great pair of ski boots offering a 130 flex stiff and offer a 98 mm wide narrow fit. The trademarked 3M “Thinsulate” insulation will help to keep your feet warm while you absolutely own the slopes. 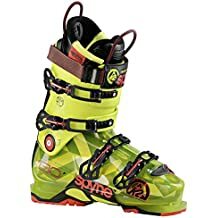 Speeding down or shredding, these boots give a solid amount of control and are consistently mentioned as one of the absolute lightest of the alpine ski boots out there. The liner is memory fit 3D and that liner allows for additional comfort especially for a boot that qualifies as stiff and setup for narrow feet. The memory fit means more of a custom fit since the inner foam will move around your foot and then firm up over time – creating that custom type feel. There are multiple other parts of this ski boot that make it very attractive to active skiers. The strong cuff alignment, trademarked grip pads, and strong power shift make this an extremely good narrow foot ski boot. These are some of the most versatile and most customizable ski boots that Atomic has put out, and they have a large number of fans in the skiing community – for good reason. Incredibly lightweight, these are an outstanding option for narrow foot skiers with experience who can use a solid fitting for maximum control and power. Outstanding option and not built only for narrow feet! The GPX 130 was designed by skiers for skiers, as Nordica’s pinnacle in all mountain boots. Built with our anatomical 98mm mono injected PU last, hand crafted Primaloft Custom Cork race liner and soft grip soles, the GPX series was engineered to deliver whatever you need whenever you need it. The high traction dual density PU means soles that give an extra strong grip, as well as an excellent 130 flex rating. These GPX books deliver the great combination of power, quickness, and overall feel while heading down the slopes. When you hit the slopes at high speeds and a wide variety of terrain, control is something you definitely want. 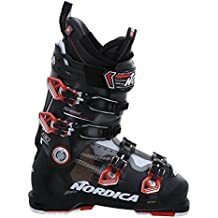 This is the next generation to the Nordica Patron Pro model and seems to keep the absolute best of that popular discontinued design while delivering even better improvements in a lot of little ways to add up to one outstanding ski boot. Especially notable is the improved lower shell and liner, leaving a modern toebox shape and giving your feet more room to stretch and react. These do take after the cork fit technology that has become very popular and does a good job of insulating the foot and giving solid control and support. They might not be truly top of the line at either, but they are excellent and both to provide an excellent ski boot that will be a major step up for most skiers, and holds up very well as an example of an outstanding technical ski boot. Great technical skiing boot by Rossignol. The Allspeed Pro 120 ski boot by Rossignol comes from a polyether shell with aluminum buckles. Featuring a flex level of 120 this well constructed ski boot includes a solid outside layer that is offset by a great plush interior that keeps you comfortable even after hours on the slopes. Add in the sensor blade technology for a better anatomical fit that allows you a better feel on the slope, and there is a lot to like about what this particular ski boot brings to the table. These ski boots include Thinsulate insulation to keep you warm and comfortable, and the flex adjustment means an excellent assortment of options when it comes to being reactive and having full control while on the slopes. Many active skiers have described these boots as slipping on like a wide buy skiing with the power and control like a narrow. That’s a great combination that gives the best in comfort as well as control. They are warm, comfortably cushioned, and have scored heavily in head to head competition with many other available brands. 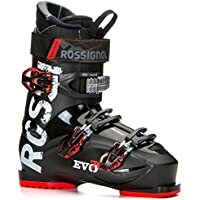 This is one of those rare designs of ski boots that get really positive reviews from a wide array of different skiers, suggesting a strong versatility that many ski boots are going to be hard pressed to match. 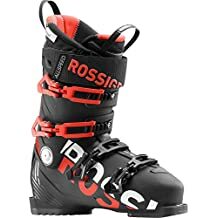 The Alias 120 ski boot model from Rosignol is a great new arrival that produces power, performance, and an outstanding comfortable fit that is specially aimed at people with larger feet – not only in length or regular size, but for also skiers with especially wide feet. This is true whether thick feet or flat feet, and having the space to accommodate larger feet makes this a fantastic option for those of us a bit on the bigger side. The ALIAS 120 creates a comfortable fit that gives you all the power, control, and performance that you want from a really high quality ski boot. The forefoot is well contoured, the heel cup is strong, and a spacious toe box means every single potential problem area is dealt with, leaving you with better support while keeping all the power and control that you want and need. There’s a reason this model is frequently one of the best selling options out there, and this is the widest model that Rossignol produces. This is a truly well-designed ski boot that really gives you everything you want out of a boot while you are out shredding the slopes. Another great option from the trusted Nordica brand. The SpeedMachine 130 design from Nordica provides an all-mountain style of ski boot that has made our list because of its outstanding features. Key features include a natural 3D cork liner that is strong, comfortable, and can be molded by heat to help create a custom fit that combines the best in comfort, power, and control while remaining a relatively lightweight option. This is a ski boot that is all about peak performance, and that starts with the perfect fit and supported by the absolute best materials. The lightweight support combined with the heat moldable lining to give skiers what they want when shredding down the slopes. The design also offers something plenty of narrow ski boots don’t: a little bit of extra room for your legs. These are extremely well balanced and that allows you and your skis to be very reactive to the surfaces you’ll be skiing on. That direct contact feel makes a huge difference and helps you maintain a solid feel for the slopes no matter what your speed. A good medium fit with a solid locked-in base on top of that, these boots have a fantastic reputation for providing an exceptional all around experience on the slopes that combine an outstanding combination of perfect fit, solid performance, and easy to use and adjust. These ski boots are just outstanding. Excellent pair of men’s ski boots. The SX 130 is another fine model of ski boot from the guys over at Lange and these are receiving some high marks from a wide array of skiers from the casual skiers who hit the slopes a few times a winter to the heavy duty skiers who spend every possible hour on the mountains, these are an excellent option for most skiers, especially those who like a wider than average fit for their feet and appreciate the 130 flex level of stiffness that has become so popular in recent years. For larger skiers with bigger feet, a narrow fitting boot is just never going to be comfortable and when the fit is bad, they are not going to see the same benefits as many other individuals with narrow feet that fit those boots naturally. These wider ski boots offer a stiff flex that are often preferred by two groups in particular: large bodied skiers (like the author here) or expert skiers. The solid design means you are in good shape for going down even the most challenging of ski slopes, and with a gray/black and orange style that looks really good aesthetically, as well. Outstanding stiff fit style of ski boot. A bit older than most of the other entries on this list, but a classic, the Spyne 130 LV model of ski boots from K2 is a solid stiff boot that is designed as a narrow boot for a tight fit that allows a powerful drive through turns. This boot won’t be everyone, but for the right type of skier that needs that power through turns and that level of control. The Spyne 130 LV is a solid option that rates well as part of the top group despite the really stiff competition. The fit is strong, the boot is undeniably sturdy, and the four straps mean a tight and sturdy fit that made it popular with test skiers who are looking for a strong and study option. These ski boots do naturally relax a little bit when they are being broken into while on the slopes. Most experienced skiers recommend molding the interior liner to your foot to make sure that tight fit doesn’t mean an uncomfortable fit. K2 is a brand that knows how to create an outstanding ski boot that is going to hold up to the heaviest use on the slopes. Firm flex and strong lateral movement ability means this is a boot that is going to remain a favorite among many skiers no matter how many new models come out in the months and years to follow. While the list up there is our pick of the top 10 ski boots available, finding the right fit is also crucial if you are going to get the most out of any model no matter how solid it is. Most really good adult versions (both men’s and women’s designs) are a front entry overlap type of design which allows for a better and more specialized fit. 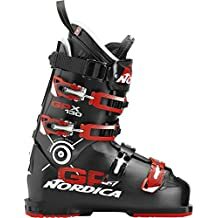 However, when looking for good beginning ski boots for kids it is worth noting that a lot of these designs will be rear entry in nature, making them easier to take on and off but not giving the same level of grip or control. This is normal, but it is important to note once you get to the full sized boots regardless of your particular needs, fit really matters. The best narrow fit ski boots won’t work well for someone cramming wide over-sized feet into them. Likewise a wide fit means just that – and the fit will be too loose for individual skiers with narrow feet. One isn’t necessarily is better than the other, but each will have its strengths and weaknesses depending on what it is you are looking for. Soft flex boots, for example, are best for beginners but the least ideal for serious or professional skiers. Medium flex ski boots are great for intermediate level skiers and are a natural transition from soft flex boots to the stiff flex that many pro or semi-pro skiers prefer. The actual sizing of ski boots will change from one brand to another, they’re not completely uniform, but by actually measuring your foot and taking a look at what each company has for comparison you will be able to figure out what is the best option for you. Ski boot liners will generally come in one of three forms. Non-moldable are just that. They’re in the shape that they are in and while there might be a small amount of forced movement over time, in general the shape is the shape. There are two other types of liners that are much more moldable and they can be under thermoformable or custom mold builds. These styles allow a much more custom fit around your foot on the interior, within the limits of the outer shell. This is one case where customizing is generally considered better by most skiers on a case by case basis. Q: How do I know what size to get in comparison to my normal shoe size? A: This is one of those where you need to use some degree of experience and actual foot measurements to get a sense of which one is best for you. Generally speaking the sizes tend to translate though if you have an extra wide foot or long foot you may need to go one size larger to get a good fit. Q: Who makes the best ski boots? A: While there are several top notch brands that consistently put out really high quality ski boots, this is a complicated question. The brands on this list are good choices, but the answer to this can differ greatly depending on what type of ski boots you need. The best wide ski boots are going to be very different than the best narrow ski boots. Same for men’s versus women’s or adult versus children. However if you’re on this page, then you’ve got a great list of elite options to start from. Q: What is the difference between soft, medium, and hard flex in ski boots? A: Soft is best for beginners and means there’s a little more movement but you get less power put into your skis while hard flex is tighter but gives you a lot of power in turns and movement. Medium is just that, it is the spot in between those two extremes of soft flex and hard flex. Q: Are ski boots really worth buying? A: This generally depends on a couple of things: your budget and how often you ski. 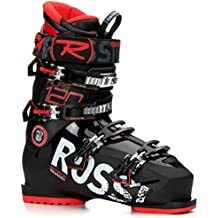 If you don’t ski often but you love hitting the slopes 1-2 times a year and are a high earner with disposable income then a good pair of truly high quality ski boots could be worth a buy. For frequent skiers who hit the slopes every winter or live in the right area, ski boots are going to make sense as a great buy. However for many individuals who don’t ski very often, ski boots might not make as much sense as a purchase. You’ll have to take a look at your situation on a case by case basis. Q: Are ski boots and bindings interchangeable? A: No. While there’s a lot of flexibility, you need to remember that there are skis of different sizes and dimensions, which means there are going to be different boots and bindings as well. While there’s a lot of ability to mix and match, every part of the skis and ski accessories match up perfectly. Q: Are ski boots insulated? A: Many of the premium options are, but this depends on a case by case basis. For many basic designs and especially those you find at many rental places, they will not be insulated so make sure to wear incredibly warm socks! Q: Are ski boots unisex? A: Yes. Sizing is done via a number system and while women and men each individually need to see what number relates to their normal shoe sizes, the boots themselves are generally unisex and all about the numerical size. That being said, there are some brands that tend to make some meant for men and other for women. Q: How do I transport ski boots? A: There are many fantastic ski boot bags out there, as well as modified backpacks. For air travel, you will generally need to check the baggage. Q: What do ski boots cost? A: This can vary quite a bit. For premium options they can run anywhere from as low a $125 in rare low cases all the way up to $750 or more for truly professional level high end ski boots. Ski boot are not only a critical piece of equipment but they can also be incredibly stylish and really bring together a great look while providing the high level of grip and control that are necessary to really fully enjoy a day out on the slopes.